Aside from surfing, whale watching is usually the first thing that comes to mind when picturing a vacation on Canada’s west coast. 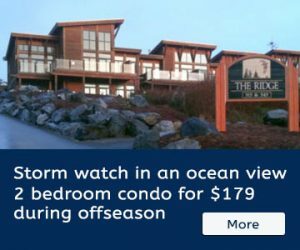 Ucluelet is the place to do it, rivaling nearby Tofino for the top spot, as oftentimes the migrating giants opt for Ucluelet’s sheltered bays over Tofino’s exposed waters. This is also a bonus for those who tend to get seasick in large swells and open ocean. The two communities come together in March to celebrate the annual Grey Whale migration in a popular festival known as the Pacific Rim Whale Festival. Although still quite chilly out, this is a great time to get on the water and spot the nearly 20,000 Grey Whales, who return to the area from the Baja Peninsula, where they breed, en route to their summer feeding grounds near the Arctic. Besides the whales, the 9-day festival involves over 90 events all geared towards educating visitors and locals alike about the incredible ecosystem, both marine and forest, that they find themselves surrounded by. Outside of migration time, whale watching remains steady. 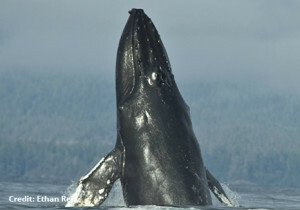 In fact, you can go whale watching out of both Ucluelet and Tofino year round! From Ucluelet there are two areas that most charters will head out to, Clayoquot Sound and Barkley Sound, 35 minutes south. Here, pods of transient and resident Orcas, Humpbacks and Greys have been known to surface for a breath of fresh air and hangout all year, although Orcas are more of a rarity than the other two species. As an added bonus, whales are usually just one of the many types of west coast marine life you will spot while on a tour! Eagles soar, sea lions and seals bob in the water and relax upon the rocks and plenty of other birds and fish are abound in the area. Porpoises and pods of white-sided Dolphins occasionally join the tours and play in the wakes of the cruising boats. Bear watching is also a common excursion visitors to the coast embark on, as they can often be seen by boat along the shoreline. Appearance: Gray Whales are, unsurprisingly, medium to dark grey in colour, usually with white patches and scratches, barnacles and orange sea lice on their skin. They do not possess dorsal fins but have a series of “knuckles” on their backs. Size: Females win for this category as they are typically a bit longer than males, who, when fully grown, reach about 14m in length. This is about 2m longer than a school bus! They can weigh anywhere from about 27,000-36,000kg. 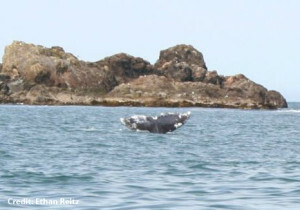 When to see them: During their migration, Gray Whales hug the western coast of Canada from about March to mid-April. Resident pods can be seen all year round. Appearance: These guys are the largest of the whales around the Island. Colour-wise they are similar to Grays, although they are darker and range from dark grey to black with white markings. Most distinctive is their hump, for which they are named, accompanied by a stocky body. They also have baleen plates on the sides of their mouths. 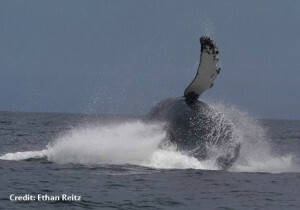 Size: Humpback whales grow to be about 12-16m long and typically weigh around 36,000kg when fully mature. They possess the proportionally longest pectoral fins out of all whale species, usually growing to about 4.6m long. When to see them: Feeding season for Humpbacks is during the summer months so May-September is regarded as the best time to view these humble, humped giants. Appearance: Chances are you can already picture what an Orca looks like – Black and white with a white eye-patch and massive dorsal fin. Looking more closely, orcas are identified by their saddle patch patterns and their dorsal fin shapes. Saddle patches are grey patches just behind the dorsal fin, which looks like a riding saddle. Size: Male orcas grow to be about 7-9m long and weigh about 6,000kg whereas females range from 6-8m and weigh close to 4,000kg. When to see them: There are about 80 resident Orcas in the Pacific Rim area that hangout year-round, although sightings are rare. Second generation charter company. First-class boats with a comfortable price!